Install the cartridge into the stainless steel housing following the instructions on the cartridge wrapper. 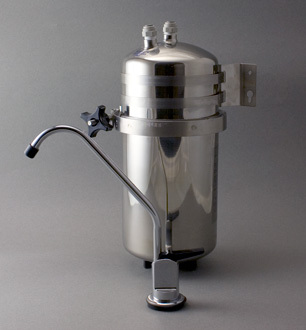 Install the two quick-connect fittings into the threaded ports of the stainless filter housing. Install the faucet, following the instructions included with the faucet. Install the inlet kit, following the instructions provided with the inlet kit. Position the filter under the sink, using either the wall-mount bracket or the plastic stand provided. Insert the faucet tube into the “Outlet” port on the Multipure (center port); insert the tube from the inlet kit into the “Inlet” port of the Multipure. Rinse for at least five minutes before using the water. Please call if there are questions or problems.